chow with chow: so long 2009... hello 2010! so long 2009... hello 2010! 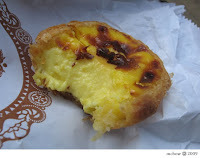 - the best egg tarts/po-tats ever (from royal garden*). 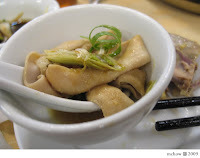 - hot pot with lamb intestines. - mango butter from the bohol bee farm. 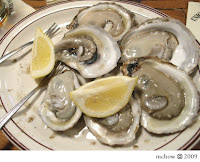 - fresh oysters on the half shell from the union oyster house. 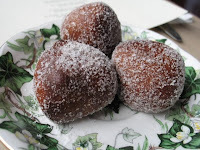 - fresh chocolate banana doughnuts from the sparrow. - dandan noodles from wing lai yuen (詠藜園). 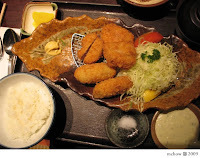 - the best porkchops in the world (tonkatsu from tonkichi). - soup dumplings with amazing beijing chili oil (北京水餃店 beijing shui gau shop). and to everyone who has given their time of day to this blog, have a happy and healthy 2010! *note to royal garden management: continue to make these things and your patrons will die in bliss of heavy coronary blockage. be forwarned. wham! bam! thank you lamb! foodies of the web unite!